tie-dyed team t-shirts out to dry on the school fence. Every year, for Lag B'Omer, Akiba-Schechter holds the grand Color Wars. Children in grades 1-8 are organized into teams, with one student from each grade on each team, along with a teacher or two. Due to the growth of our school, this year that means 11 teams with 13 kids each! It also means some 170 t-shirts for students, teachers and staff have to be tie-dyed to represent the different color teams. Our Art teacher Debbie Lekousis undertakes this grand project, and over the years she has perfected the process. Once the requisite number and sizes of t-shirts have been ordered, Art class becomes about learning how to tie the fabric with rubber bands to achieve different patterns. For the younger students, mastering the rubber bands themselves, and getting them tight enough to hold the fabric during the dyeing process, is enough of a challenge. Older students learn how to pleat the fabric to create a swirl pattern or twist it to get a perfect bull's-eye, and of course they always make sure to tie it tightly so it won't come apart in the water. After that, Debbie assembles her colors and buckets, and the school kitchen becomes a textile laboratory. With all her experience, she knows how to combine green and blue to create a vibrant teal, or she throws a bit of wine red in with violet to create a deeper color. Yellow, she has found, does not work so well, as the kids won't be able to see the patterns they worked so hard to create. There is, however, lots of heavy lifting involved, see the dye buckets above. Boiling water is poured into each bucket, along with the colors and the salt to set them, and getting all those gallons of water to boil took three hours altogether this time around, even with the help of a colleague. Dressed all in black, wearing an apron and rubber gloves, Debbie stirs the giant buckets with a dowel rod to make sure the color distributes evenly. Then the buckets sit overnight, and in the morning the water is almost clear as most of the color has been sucked into the fabric. Now comes another heavy-lifting chore, in which thankfully other colleagues help: pouring out the water and hanging the t-shirts out to dry. Sadly, the air was so cold yesterday that the kids' hands got too cold wringing out the t-shirts, but they did help pick up all the rubber bands so the birds don't mistakenly eat them. Debbie herself had to wear sturdy rubber gloves to wring out and hang up the t-shirts. At the end of the day, the t-shirts hadn't properly dried yet, so the school dryer was running full time, and a few parents and staff members took loads of t-shirts home to run through their dryers as well. But even when it's cold outside, all those colorful t-shirts are a sight to see! Thank you, Debbie, for being our tie-dye queen, and for getting us ready for another day of Color War fun! 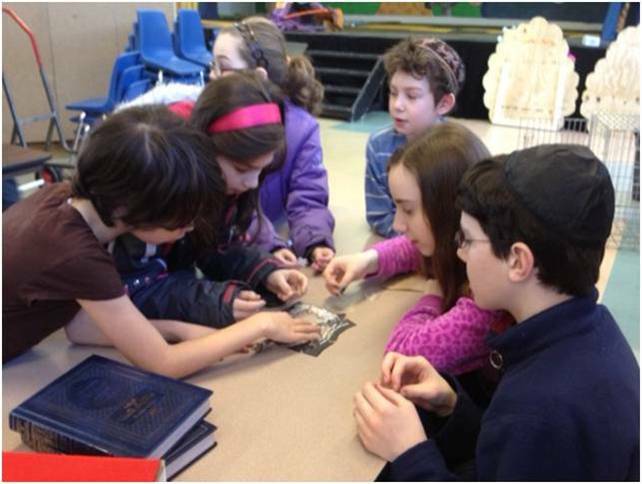 Daily prayer (we usually use the Yiddish term “davening” or the Hebrew term “tefillah”) is an integral part of the Akiba-Schechter curriculum. School days begin with morning prayer, which we hope is a meaningful and powerful experience for our students. The goal of daily prayer is to establish a connection with G-d and to view it as a daily conversation—a chance to talk to G-d in a structured environment and to impart the idea that G-d is always there to listen. However, after years of daily prayer, some of our 7/8th graders felt it was getting repetitive and lacked meaning in their lives. So davening teachers Baila Brackman and Alise Gold decided to look for ways to make daily prayer more exciting and relevant for the students. Our current tefillah curriculum is based on the model of the Or Chadash Kaleidoscope foundation, an educational facility based in Israel. Their model focuses on connecting social skills with the tefillot we say each day. The hope is to teach students that davening is not just a half hour out of their day, but rather a constant presence that connects to all their daily interactions. In practice, we have taken some of the ideas from this program and fit them into our unique and special school environment. At morning prayers, the 7/8th graders now spend at least a few minutes each day with Mrs. Brackman and Mrs. Gold discussing a new theme or idea connected to praying. The topics vary from themes such as happiness and gratitude, or focus on one prayer, such as Ashrei, or the morning blessings. These discussions provide a forum for the students to identify the themes of prayer that are also present in their everyday lives. A program for the 7/8th graders to mentor 3rd and 4th graders was also added to our davening curriculum. Each week, the 7/8th graders prepare a discussion, applying the theme they have been focusing on so the 3rd/4th graders can relate to it. For example, they might read a story and discuss connections between the story and their own davening. Other times, the 7/8th grade mentors will lead a hands-on project or activity. Most recently, they worked on putting together a puzzle with the 3rd and 4th graders in order to decode a hidden message about davening: "Sometimes it takes time to piece our moments of inspiration together. But if we give up, it will be an incomplete picture." We continue to explore ways to make daily prayer more relevant and exciting, and it is our hope that students will find the connections between davening and their daily lives and look forward to their daily conversations with G-d.